CERN and the local organizers are indebted to Ericsson Nikola Tesla which offered welcome presents to participants. 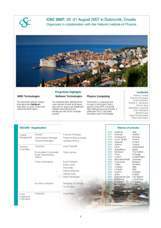 ... as well as to the City of Dubrovnik, for providing free access for CSC students to the city bus transportation system and offering the closing cocktail in the old town, and more generally for helping in providing access to local facilities. 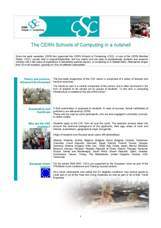 Since the early seventies CERN has organized every year the CERN Schools of Computing (CSC) in one of the CERN Member States. CERN Schools of Computing, usually held in August/September, are open to postgraduate students and research workers with a few years of experience in elementary particle physics, in computing or in related fields. The participants come from all around the world and are typically of 15 to 25 different nationalities. A fraction of them come from outside the physics community, generally attracted by the advanced topics that are taught. Attendance is limited to 80 students.